The WP ERP Accounting is the structured with an intuitive interface that makes it a perfect accounting software for anyone who has never taken an accounting class and has no idea what a balance sheet, debt, credit, income statement or statement of cash flow is. 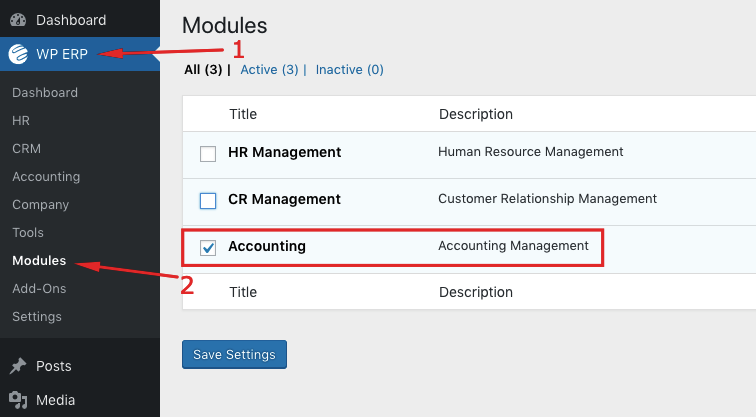 This documentation goes through the functions and features of the Accounting module and how to use them. To get started, first tun on the module by navigating to WP Admin Dashboard → WP ERP →Modules. Click on the check-box for Accounting. You will now see the Accounting tab in your side menu bar when you refresh the browser.